Whether it’s 4/20 or just Friday, we’ve crowdsourced Portland’s most tokeable tunes from those with the finest taste in cannabis and music. Whether explicitly about bringing a blunt through or just providing the right vibe to spark up a J and chill out, listen to the complete four hours and 20 minutes of this high-flying playlist now. The boutique label's latest comp is a testament to the spirit of collaboration and gloomy-yet-catchy rock and roll. Celebrate its release at Bummer Pop Fest at Kelly's Olympian on April 20. Join the Vortex Access Party! 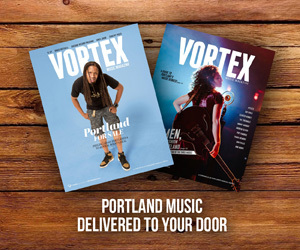 Just like a vortex in nature revolves around a central axis, Vortex Music Magazine revolves around our community—aka you! Join the Vortex Access Party today! We turn five with our 20th issue, which drops on 4/20—and we all know that music and cannabis make a merry pairing so let's celebrate! Join us a day early on April 19 at Artists Rep when ePP, Maarquii and Sam Cyph perform stripped-down songs and share the stories behind them at Musical Interlude: Hip-Hop! And then come drink a beer on Last Thursday at Cravedog's happy hour on April 25. And experience the true, often unseen, world around you through her eyes. Don't miss the release of her new record ‘The Question’ out on Fluff & Gravy Records at OMSI's Kendall Planetarium on May 2. Learn how to make money in today’s music biz from industry pros at Marmoset, CD Baby and WagsWorks at our free, all-ages panel conversation at the Doug Fir on Sunday, May 19. Mark your calendar—and if you can't make it, support the live stream it here! Portland's vibrant music scene is supported by local businesses that value music in our community. Check out these supporters of Vortex Music Magazine that play a vital role in encouraging, enabling and cultivating the music that circulates through the veins and culture of our city.